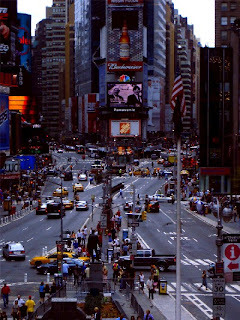 My family and I started summer vacation in NY thanks to GRR and LCR....very close friends of mine. We flew in and arrived around 11:45 AM. Our friend Danny picked us up at JFK Airport and dropped us off at our hotel after about an hour of traffic on the Van Wyck. After we checked in, we went up to our room, dropped off our stuff and walked around for a while. 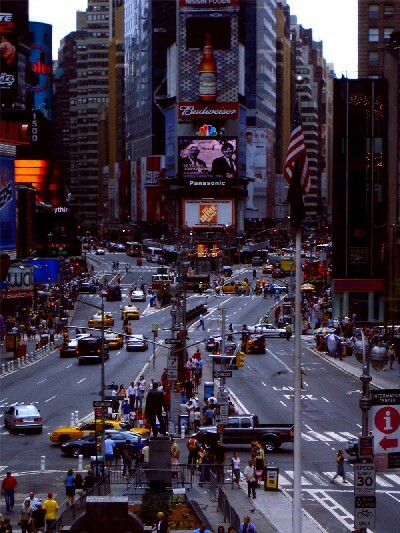 We were on Broadway and 64th which is midtown and next to the NY Dance Theater. We walked down to Times Square and ate at the Carnegie Deli for dinner. If you've never been there, be warned - VERY LARGE sandwiches. When you walk into the Carnegie Deli, there is a giant statue of a pickle. The decor has pictures of famous people all over the walls and some of them have been autographed. They're famous for their pickles, their sandwiches but most of all their cheesecake. The deli is a few blocks away from the David Letterman Show Studio. We got seated and they gave us a bowl of whole pickles which were very delicious. I ordered latkes, my parents ordered a VERY, VERY large reuben sandwich and my sister ordered mac and cheese. We shared everything. The reuben was very good because it did not have sauerkraut on it. I think that the sandwich was about a foot and a half tall! 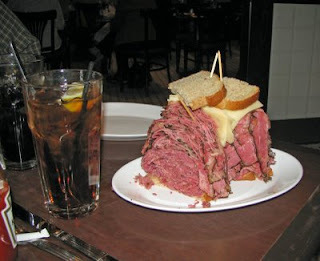 Carnegie Deli is a place you must go to if you ever go to New York. It's kind of like a touristy must do thing but it is also a very, very good deli with great food and awesome service. After that we explored around Times Square for a bit. There's a bunch of theaters, stores, cool buildings and lots to see. The next day, we ate at Mickey Mantle's Restaurant near Central Park. When we walked in, there was a bunch of Yankees memorabilia. There were a bunch of autographed baseballs signed by famous people including Pablo Sandoval. If you are a Yankees fan, it's the coolest place to go besides Yankee Stadium. Once we were seated, we ordered some buffalo wings which were really good. They were served traditionally with some celery, some carrots and some blue cheese dressing, for dipping. My mom and I ordered a Classic New England Lobster Club to share and my dad ordered a Philadelphia Rib Eye Steak Sandwich and my sister had a kids burger. The lobster club was a very good sandwich filled with chunks of lobster, cheese, a little mayo and tomatoes on a toasted bun. My dad said he liked the Philly steak sandwich and I thought it looked pretty good. I would definitely recommend this place to anybody who is a Yankees fan and likes bar food! When my dad and I got there, we went inside. Inside there was a big full on gourmet buffet with chefs standing by. This was not your ordinary ball game experience. It was all part of the gift...which was amazing. I had an Arnold Palmer to drink, some chilled lobster and shrimp, some veal and a big old delicious salad and for dessert I had the world's best gelato I've ever had! There was also a complete dessert bar, a french fry, onion ring and other fried things on a buffet. There was a full on sushi bar and downstairs there were two bars. A drinking bar and a gelato bar. I didn't go to the drinking bar because I'm too young...yuck! But, I did hit up the gelato bar at least ten times....it was so, so, so, SO good! There was also a candy bar. After we feasted our weight in food, we went out to watch batting practice. But the thing that stunk was that the Red Sox were doing their batting practice. Then the game started. We ordered more Arnold Palmer's and then we settled in to watch the game. Right around the 2nd inning, I went back to get more gelato and take a bathroom break. The bathrooms are very nice. They have TV's in the bathroom so you don't miss anything while on your break and there are also bricks in there from the original Yankee Stadium. 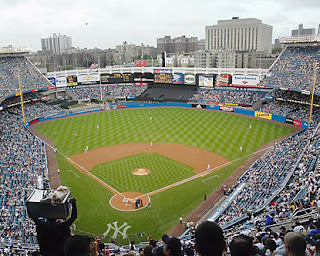 Near the 8th inning, so many people had left the game because the Yankees were down 11 to 6. No one was sitting in the front row, so me and my dad moved down to it to watch the rest of the game. Then after that, I ordered a malt which was VERY, VERY, VERY good. Even though the Yankees ended up losing 11 to 6, it was one of the best days of my life. I also got a Derek Jeter baseball from an usher. 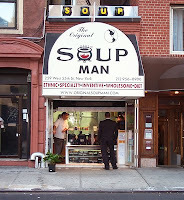 Another place to check out is the Original Soup Man which was mentioned on a Seinfeld episode. You order from the sidewalk and there is a variety of different soups and bisque's to choose from. There is also gumbo. I ordered the gumbo which was spicy and very good, my dad ordered the lobster bisque, my mom ordered vegetable barley soup and my sister ordered chicken noodle. All the soups are in big witch like pots. The first time we went, there "Was no soup for you" because they were closing. The second try, there was soup for us! I highly recommend for those of you that like soup. New York has the best pizza's I've ever had. They have pizza places everywhere where you can order a whole pizza or just a slice of pie which is at least a quarter of the size of a California pizza. The only pizza I ordered was Margarita Pizza. In case you don't know, it is fresh mozzarella cheese, sliced tomatoes and basil...kind of like a caprice salad on a pizza. The crust is thin and soft. 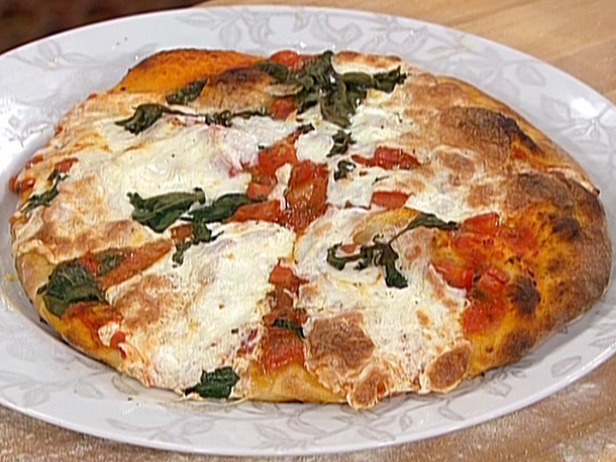 It is very, very, very good and a highly recommend it to those of you who like pizza. 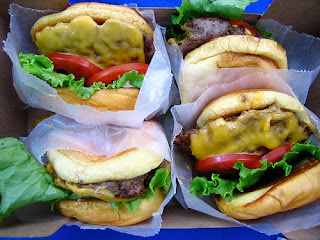 The Shake Shack was a place that was recommended by our friend. It's just kind of like a NY version of In-n-Out but better. They have shakes, burgers and fries...it was very good. It's a very busy place so we had to wait a while to get a table but it was worth it. I ordered a burger and a half and half milkshake. A half and half milkshake is a shake with both chocolate and vanilla ice cream in it. It was good. It had an interesting chocolate flavor kind of like a malt. So overall the Shake Shack experience was really good. Just be prepared to have to wait in line for food and a table. 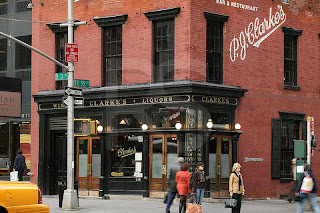 HISTORY - THE modest building at 915 Third Avenue on the Upper East Side of Manhattan has stood on the northeast corner of 55th Street for approximately one hundred and twenty nine years and has witnessed wholesale changes in the neighborhood, some so radical as to seem almost surreal. Alone, cast as a sentry, protecting the vast 45 story skyscraper behind it, this 'holdout' building is still kicking after surviving numerous changes, alterations and usage. What the future may bring seems safe for now, but if the past is any clue than one may wonder what the final outcome will eventually be. What is known is that city records date the building from 1868, although the present owners claim 1864. In any event, it is safe to say that the building did replace squatters shacks on this block and subsequently, the adjoining buildings on the various other lots have dates of construction from 1862-1871. The records in the Municipal Archives list Mr. Steven A. Walker as the owner as early as 1884. This was a favorite restaurant of Frank Sinatra's....one of my favorite singers. I ordered the baked macaroni and cheese with blue cheese, bacon and peas. It was EXTREMELY good....it was creamy, the bacon was crunchy...it was so good. It was a pretty cool place too. My dad had a steak and my mom had a burger. Everything was super good, fresh and delicious. It was the perfect way to end our vacation. 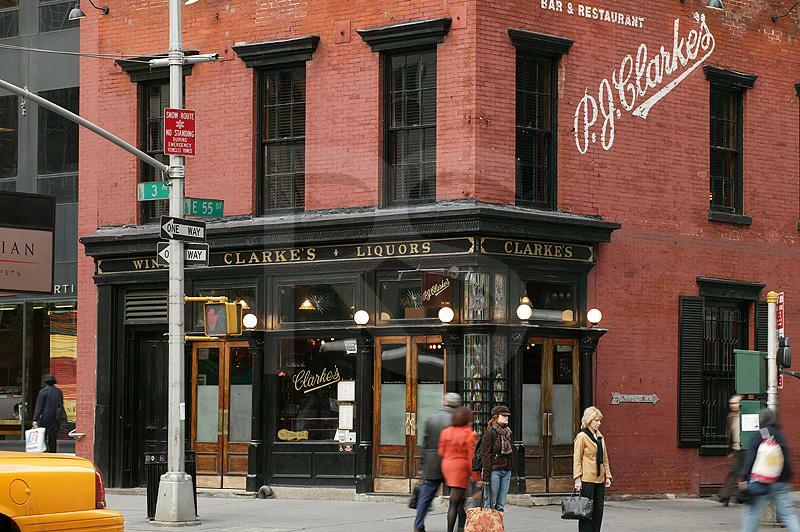 I would highly recommend PJ Clarke's to anyone visiting NYC! Definitely go to NY....definitely go to The Soup Man especially if you are a Seinfeld fan and definitely go to the Carnegie Deli! You will not be disappointed. It probably was the best trip of my life. PS: Let me know when you are going and I will give you some food notes. PS again: Thanks for reading my blog.